For ninety years the Memorial served as the county’s historical museum, as intended. But in 2004 the county moved the museum to a site more than twenty miles away. The Memorial has since stood vacant. That abrogation of the county’s obligation was compounded in October 2013, when the county legislature voted to demolish the Memorial and a later attachment, the former Board of Elections Building (BOE). As a historian of the 154th New York Volunteer Infantry, the most representative Civil War regiment raised in Cattaraugus County, I immediately and publicly protested the county’s demolition plan. I mobilized the hundreds of descendants of members of the 154th Regiment I had contacted in decades of research. As a result, in autumn 2013, county legislators received a flood of e-mails from descendants of Civil War soldiers opposing the planned demolition. 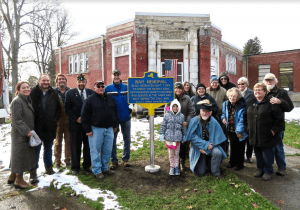 Representatives of the Landmark Society of Western New York (LSWNY) toured the Memorial and informed county officials that the structure could be economically rehabbed and adapted to a new use. Their suggestion was ignored, but because of the widespread protests the county put its demolition plan on hold and the situation settled into a stalemate. In November 2014 a crucial step was taken when Citizens Advocating Memorial Preservation (CAMP) was formed with the mission to preserve the Memorial and urge its restoration and reuse. 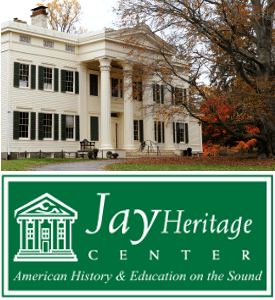 In 2015 CAMP received a grant from the LSWNY that funded a comprehensive historic preservation plan by Clinton Brown Company Architecture of Buffalo, specialists in the field. The Civil War Trust, the Cattaraugus County American Legion, and the Sons of Union Veterans of the Civil War endorsed CAMP. The original architectural plans for the Memorial were discovered. CAMP conducted a ceremony at the site on Memorial Day, starting an annual tradition. CAMP was incorporated as a 501(c) (3) nonprofit organization. The LSWNY named the Memorial one of its “Five to Revive” key properties in Western New York in need of investment. What has happened in the years since that November 2015 story here at The New York History Blog? At the end of that year, the county legislature failed to pass a resolution seeking bids to demolish the Memorial. In 2016 CAMP members accompanied legislators on a tour of the Memorial. (Most of the legislators had never been inside the building.) New York State deemed the structure to be unsafe and condemned it. In late July, the county legislature recommended selling the Memorial. CAMP continued to work with the county legislators and the LSWNY to further its mission. In June 2017 the county announced the Memorial and BOE complex was for sale by bidding. CAMP was the sole bidder and purchased the complex for $1,079. A local newspaper headline read, “C.A.M.P. saves Civil War Memorial from wrecking ball.” CAMP accepted tax-deductible donations through the Cattaraugus Region Community Foundation and a Go Fund Me page. In October the sale of the complex to CAMP became official. In 2018 CAMP accepted donations from individuals and foundations, and took care of maintenance issues on its new property. In August a large crowd gathered on the Memorial grounds during the 33rd Annual Reunion of Descendants of the 154th New York, which coincided with Little Valley’s bicentennial celebration. The following day CAMPers accompanied New York State Senator Catherine Young on a visit to the complex. On Veterans Day a historic roadside marker on the Memorial lawn, funded by the William G. Pomeroy Foundation, was dedicated. Early in 2019 CAMP hired Clinton Brown Company Architecture to collaborate on a strategic business plan. CAMP also sought public input by issuing strategic planning and fundraising surveys to measure interest and opinions regarding CAMP’s mission. Today CAMP invites you to join us in our mission to restore and reuse the Memorial complex. 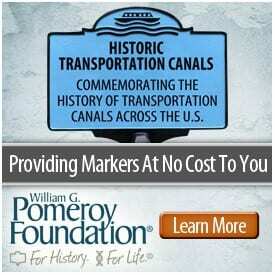 Visit our website (http://cattcomemorial.com) to learn more about our mission, and please take the Strategic Planning and Fundraising Surveys accessible there. The survey results will help CAMP and the Clinton Brown firm develop and implement a plan for the restoration and reuse of the historic Memorial. And if you see fit, make a donation to help our cause! Spread the word about our mission to restore this long-neglected Civil War Memorial! 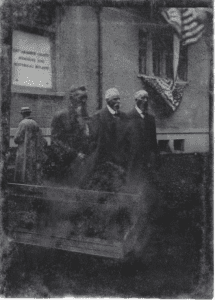 Photos, from above: Three Civil War veterans pose for a tintype at the dedication of the Cattaraugus County Memorial and Historical Building, September 7, 1914; and CAMP members gather at the dedication of the Pomeroy Foundation marker in front of the Memorial on Veterans Day 2018. Thanks Wally. I fixed it.